Easter Seals of Southeastern Pennsylvania serves Philadelphia, Bucks, Chester, Delaware and Montgomery Counties in an effort to maximize the independence of children and adults with disabilities. Easter Seals provides exceptional services to ensure that all people with disabilities have equal opportunity to live, learn, work and play. For mailing addresses, see our Locations page. For more information, please contact us. Easter Seals Eastern Pennsylvania (ESEP) provides quality services to children and adults with disabilities, and support to their families. For service site contact information, click here. To create solutions that change lives of children and adults with disabilities and other special needs. 45th St. & Penn Ave. Welcome to the web site of the Centre County Down Syndrome Society (CCDSS), an affiliate of the National Down Syndrome Society and the National Down Syndrome Congress. The CCDSS was organized by a group of families in the Centre County PA region who recognized a need for, and wanted to provide, a local informational and support resource network. This site has been designed as a resource for families who have received either a prenatal (during pregnancy),postnatal (after birth) diagnosis of Down Syndrome, adopted a child with Down syndrome as well as for healthcare professionals seeking to provide their patients with more informed, comprehensive service. The Chester County Down syndrome Interest Group (CCDSIG) is a nonprofit organization that began in 1998 with a group of parents who wanted to meet for social contact and support. They are students, they are lawyers, the are teachers, they are scientists, they are tradesmen, they are bankers, they are homemakers, they are doctors; they are all people whose lives have been touched by Down syndrome. Their goals have now expanded to include reaching out to new families, providing educational and social opportunities for existing members, and educating the community in order to promote awareness and inclusion of persons with Down syndrome. The Down Syndrome Association of Pittsburgh is a group of parents and professionals dedicated to enriching the lives of people with Down syndrome. The mission of the DSAP is simple. We are here to support families by providing: New Parent Packets to families beginning their journey; financial support to the Down Syndrome Center at Children’s Hospital of Pittsburgh of UPMC for both the pediatric and adult clinics, two clinics established due to the generosity of DSAP members; and contributions to the community resources and national endeavors that focus on improving the well-being of people with Down syndrome. To Reach out to expectant and new parents of a child with Down Syndrome in the manner of Parent to Parent. To be supportive of and provide social interaction for people with Down Syndrome, their families, friends and acquaintances. To aid and challenge each family to constantly evaluate and re-think how new ideas, information and technology may help or affect their child with Down Syndrome. To educate the general public by assisting members of our community in learning to see people with disabilities as people, not as their disability. As a group, we respect individual choices regarding the education, living arrangements and employment choices made by the individual members of the group. We recognize that each family is doing their best to provide for their child and that no one knows their child better that they do themselves. 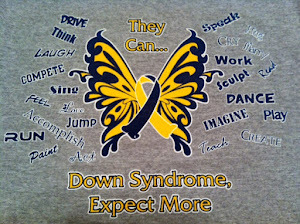 Montgomery County Down Syndrome Interest Group (MCDSIG) is a nonprofit group without member dues. The Down Syndrome Research Online Advocacy Group is a non- profit scientific and educational effort aimed at increasing public understanding and support for clinical and biomedical research into Down syndrome. The DSResearch Online Advocacy Group is an affiliate member of the National Down Syndrome Society. The Pocono Parents Of Down Syndrome, (PPODS), is a northeastern Pennsylvania non-profit family and community based organization. Their purpose is to help parents, families, friends, professionals, and persons with Down Syndrome by providing current resources for medical information, family support services, community based services and educational services. Public awareness, education and advocacy are strengthened through our association and commitments to the N.D.S.S. and Buddy Walk organizations. Their goals are to develop and implement programs that will further enhance the lives of individuals with Down Syndrome by helping them to reach their fullest potential. These are achieved through family support, community awareness, social integration and educational enrichment. The diversity of individuals in our society enriches the lives of the people in every community. We can demonstrate this on a large scale by engaging communities in events and activities that expose them to human diversity in ways that are both fun and fulfilling. Ultimately, we will foster communities of acceptance, equality, and compassion.